Cannondale Trail 5 is the right choice for riders who worry about their budget but want an excellent bike with all-around performance on milder terrain, as well as the singletrack trails. Cannondale Trail 5 is a recreational hardtail mountain bike with a more than affordable price point. It’s a bike that offers a lot to whoever buys it, including different-sized wheels. Namely, the Trail 5 is available both with 27.5″ and 29″ wheels. 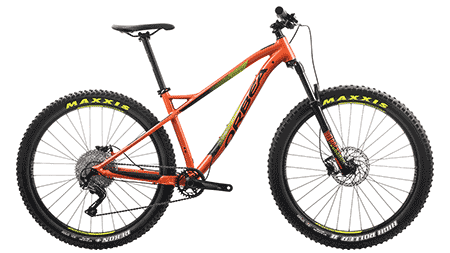 The S size comes with 27.5″, whereas the M, L, and XL sizes come with 29″ wheels. 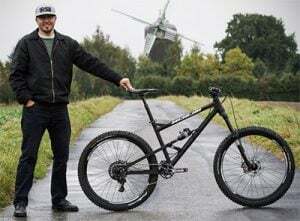 Therefore, no matter which size you choose, you will be able to enjoy reliable and consistent handling, which is often a problem with affordable trail bikes. 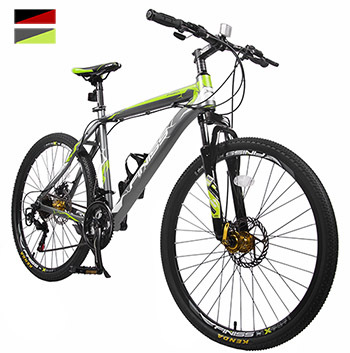 It is a reliable choice for any beginner trail rider who has big aspirations. Due to its fantastic, yet affordable, components, it has been dubbed the recreational trail riding winner by both experts and customers. Let’s dig a bit deeper and see what’s so special about this Cannondale model. 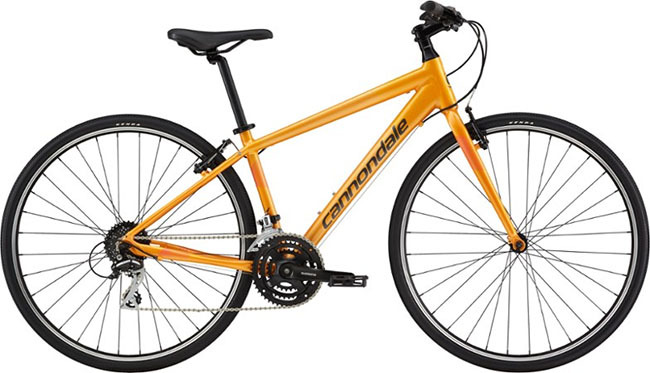 Cannondale Trail 5 is one of the models from the bigger Cannondale Trail family. 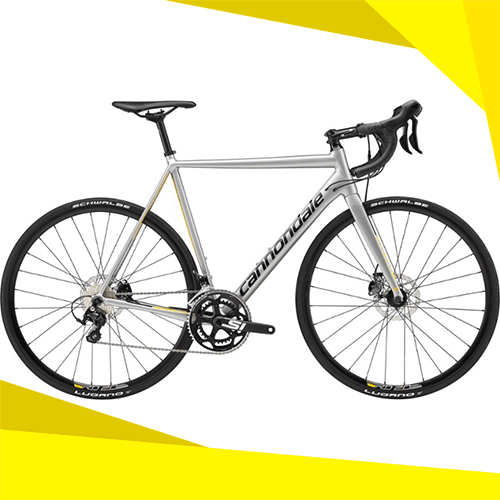 It’s built around an aluminum frame made according to Cannondale’s award-winning CAAD technology. These frames are characterized by recognizable stiffness and responsiveness, as well as smoothness and durability. The frame features a more relaxed geometry thanks to a steep headtube angle of 70-71 degrees. Thanks to this, the rider can take a more upright position and be more in control of the bike. Therefore, Trail 5 allows you to make sharp turns and be fast in the corners. The frame setup is rounded up by a RockShox XC30 fork with 100 mm of travel. It has a coil spring inside, which does a great job at eliminating bumps and vibrations thanks to the 100 mm travel. If we dig deeper and focus on the nitty-gritty, we can see that Cannondale Trail 5 is equipped with a mix of FSA and Shimano components. This is usually a fantastic combination that has proven quite well on the trail many times in the past. The shifting is done by the Shimano Deore M6000 groupset, which is Shimano’s mid-range class. According to many, it offers the best performance you can get at this price, which is why Cannondale chose it for this value model. Cannondale Trail 5 has many impressive features, but one of the best ones is the high-performance 1×10 drivetrain, made from an FSA crank and a Sunrace cassette. These simplistic drivetrains are highly desirable on modern high-end trail bikes because the maintenance is easy and straightforward. Moreover, the lack of two additional rings on the front keeps the weight down. The FSA crank has a 30T ring, whereas the Sunrace cassette is an 11-42 setup. 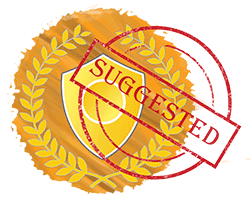 Therefore, you will have plenty of gear combos to get over any type of terrain and overcome tricky obstacles. Because of all of that, this part of Cannondale Trail 5 is the highlight in our opinion, even though it has a mix of brands. All parts of a mountain bike come together to determine whether it’s going to be a success or not. However, when it comes to trail bikes, brakes are exceptionally important for apparent reasons. 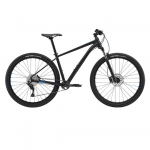 Thankfully, Cannondale did not try to save money on brakes, which is why Trail 5 comes with Shimano M315 hydraulic brakes. The 27.5″ model has 160/160 mm rotors, whereas the 29″ models have 180/160 mm rotors for even better braking performance. 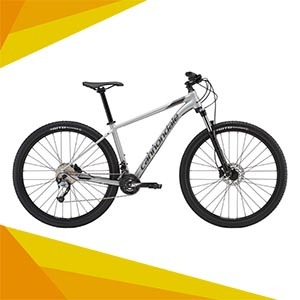 If you read through some online user reviews, you will see that those who own Cannondale Trail 5 praise the brakes the most. In combination with the upright geometry and the wide tires, these brakes will give you the confidence you need to stray away from the mild trails and explore a bit more. Wheels and tires make a lot more difference on the trail than what most people think. Luckily, Cannondale has spent sensibly on these parts. That’s why, if you buy this bike, you’ll end up with a set of WTB STX TCS tubeless-ready rims. They’re pretty light and stiff and feature 32 spokes that guarantee decent durability. Tubeless-ready means that you can get rid of the inner tube and avoid pinch flats, as well as prevent the annoying punctures on the trail. The tires are WTB Ranger Comp, and they’re 2.25″ wide, regardless of the tire diameter. The knobs on these are not too emphasized, so they’re suitable for harder terrain and smoother trails. Depending on your preferences and your standards, Cannondale Trail 5 can have some setbacks, or it can have none at all. If you’re buying your first hardtail bike or you’re upgrading from a Walmart model, you will simply love it. It’s built with your needs in mind, so you can take it out on a local trail and start making a mountain biking basis in your legs. 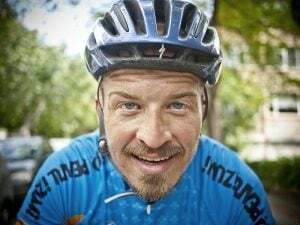 However, there are some points of improvement and some parts that you might want to upgrade when you become more proficient and you build some confidence on the trail. For example, if you plan to ride more aggressively and you need more responsive handling, you might think about upgrading the cockpit. Moreover, even though the hydraulic brakes are fantastic for recreational riders, they are not built to withstand too much abuse. But, it all depends on your style of riding. Other than that, Cannondale Trail 5 is a fantastic option for less experienced riders who are just taking their first steps in this sport.